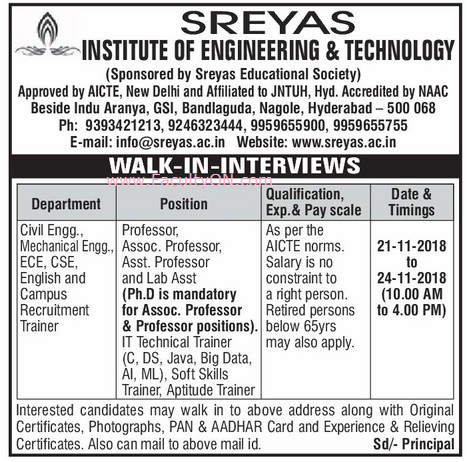 Sreyas Institute of Engineering and Technology, Hyderabad has advertised in the EENADU newspaper for the recruitment of Teaching Faculty- Professor / Associate Professor / Assistant Professor Plus Non-Faculty jobs vacancies. Interested and eligible job aspirants are requested to walk-in on 21st, 22nd, 23rd and 24th November 2018. Check out further more details below. About College: Sreyas Institute, located in the heart of the city, is the result of deliberation & planning of every aspect to create a world class technical education institution. The first impression as you enter the sprawling green and verdant campus of Sreyas leaves a lasting impression of innate calm and energizing growth. How to Apply: Interested and eligible candidates are requested to attend the Walk-in interview along with CV, originals & copies of educational certificates / mark sheets, Aadhaar card, PAN card, Experience & Relieving certificates and recent PP size photographs to the following walk-in address.